July 12, 2013 - Ethiopian Airlines reported toady that smoke was detected from Ethiopian Airlines Boeing 787 Dreamliner, registration number ET-AOP which was parked at London Heathrow airport for more than eight hours. No one was hurt, the airport runways were closed for about an hour before operations resumed. The aircraft was scheduled, Flight ET701 to be used for flight to Addis Ababa, Ethiopia at 9pm. Back in January the FAA issued an emergency airworthiness directive ordering all U.S. based airlines to ground their Boeing 787s following five incidents in five days involving the aircraft, mostly involved with problems with the lithium-ion batteries and electrical systems. Both major Japanese airlines ANA and JAL announced that they were voluntarily grounding or suspending flights for their fleets of 787s as well. 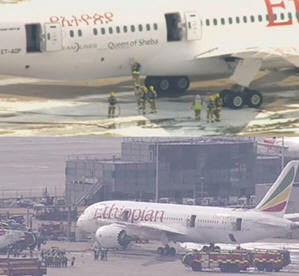 Authorities at this time have not reported the location of the fire onboard the Ethiopian Airlines Boeing 787 Dreamliner, but it now raises new safety concerns for the long troubled airliner. Back in March the FAA approved Boeing’s improvement plans for the 787 which would add several layers of additional safety features to the lithium-ion batteries on 787 commercial jetliners. In April the Federal Aviation Administration decided to allow the 787 Dreamliners to return to service after changes were made to their battery systems. Japanese authorities announced they were doing the same for their airplanes, although the causes of the battery failures to date remain unknown. UK’s Thomson Airways which became the first British airline to take delivery of the Boeing 787 in May reported that a flight from England to Florida, Flight TOM126 encountered “technical problems” onboard the B787 and was forced to return back to the Manchester Airport, UK.